Will Patrick Stewart Return as Picard in Tarantino's Star Trek Movie? This Tarantino Abrams Star Trek movie gets more interesting by the minute. Not only is Quentin Tarantino teaming with J.J. Abrams for this Star Trek movie, but it's going to be R-rated and, if all goes well, the Pulp Fiction director is going to helm the movie as well, working with a story he pitched to Paramount and Abrams. Now, to make matters even more crazy and possibly awesome, Patrick Stewart says he'd be willing to reprise his role as Jean-Luc Picard for this Star Trek movie, if there's a place for him. Here's what he had to say about it in a recent interview. "People are always saying to me, 'Will you be Jean-Luc Picard again?' And I cannot think that would be possible, but there are ways in which something like that might come about. But one of my dreams is to work with Tarantino. I admire his work so much, and to be in a Tarantino film would give me so much satisfaction. So, if he is going to direct something to do with Star Trek and there was the possibility of dear old Jean-Luc showing up again and doing that for Mr Tarantino, I would embrace it." At the moment, Quentin Tarantino is working on his new movie, known only as #9, which is set for release in 2019. J.J. Abrams, who directed the first two installments of the Star Trek reboot for Paramount, will executive produce this new movie. But he's busy with Star Wars: Episode IX at the moment. However, that will provide the studio the time they need to get this new Star Trek movie written and ready to go. Quentin Tarantino reportedly met recently with a room of writers that included Mark L. Smith (The Revenant), Lindsey Beer (Chaos Walking), and Drew Pearce (Iron Man 3). Smith emerged as the frontrunner, after they spent hours kicking ideas around. He hasn't locked down the gig yet, but it looks like he'll be penning the script from Tarantino's pitch for this new Star Trek. Will that include Jean-Luc Picard? It was indicated in an interview from 2015 that this story could involve the Star Trek: The Next Generation episode Tomorrow's Enterprise, so it's possible. Stewart further said that Tarantino would be his "first choice" for this new movie. "The one thing that characterizes all of his movies is that frame by frame, it always challenges, always demands your attention, always demands a very kind of open and generous response to what he does. I also love his sense of humor as a filmmaker. So yes, he would be my first choice." Details are scarce currently for this new Star Trek movie, but it seems to be moving forward rather quickly at Paramount. Though, it doesn't make things look good for those who were hoping to see a follow-up to Star Trek Beyond. However, as indicated in this interview with The Hollywood Reporter, we may get to see Jean-Luc Picard on the big screen for the first time since 2002's Star Trek: Nemesis, which is pretty amazing. 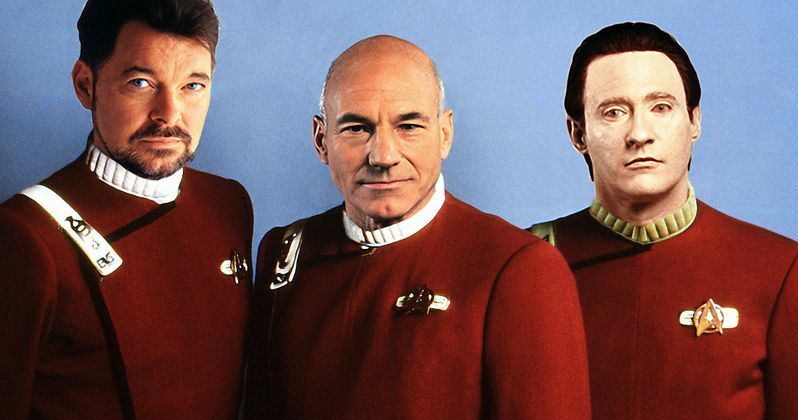 That's the kind of thing that having Tarantino doing a Star Trek movie may be able to do. People want to work with him.